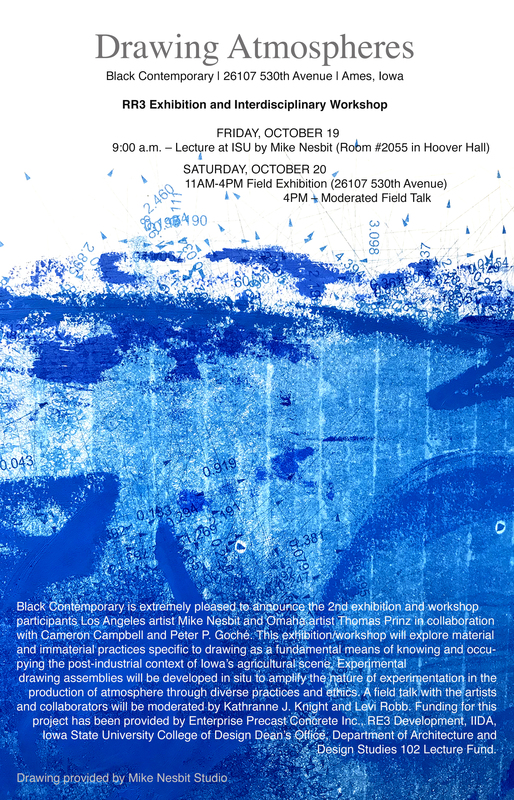 Black Contemporary is extremely pleased to announce the 2nd exhibition and workshop participants Los Angeles artist Mike Nesbit and Omaha artist Thomas Prinz in collaboration with Cameron Campbell and Peter P. Goché. This exhibition/workshop will explore material and immaterial practices specific to drawing as a fundamental means of knowing and occupying the post-industrial context of Iowa’s agricultural scene. Experimental drawing assemblies will be developed in situ to amplify the nature of experimentation in the production of atmosphere through diverse practices and ethics. Funding for this project has been provided by RE3 Development, IIDA, ISU College of Design and the Design Studies 102 Lecture Fund.